PM and his BJP colleagues maintain silence whenever union ministers come under attack from right-wing Twitter trolls. While Prime Minister Narendra Modi continues to enjoy great repute among his loyal fans, he has maintained a stoic silence over his cabinet colleagues being attacked by the troll army. 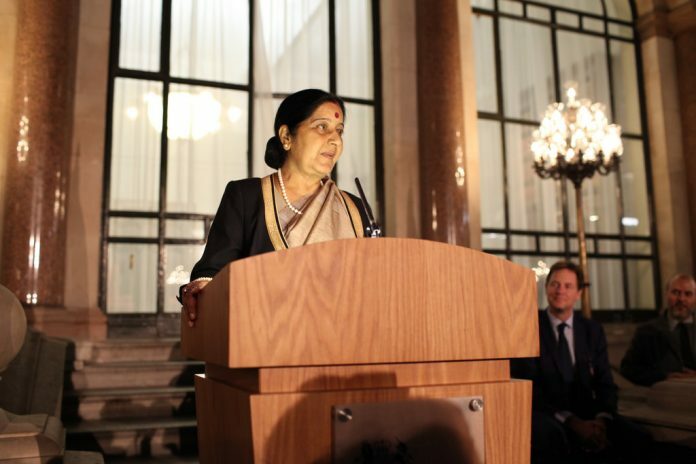 The most recent victim of Modi’s play-safe was external affairs minister Sushma Swaraj, who was attacked by BJP supporters for not being ‘Hindu enough’, because she helped an inter-faith couple with their passports. Swaraj was viciously trolled on social media, and the language used, to put it mildly, was not pretty. Swaraj’s worst mistake was appearing secular. No person, including the honorable Prime Minister or party president Amit Shah, have so far stood up for her. She, however, refused to be bogged down, and silently used the micro-blogging platform to expose the identities of those hurling abuses at her. People from the ruling dispensation, who claim to do everything to protect the honour of women, did not make even one comment or tweet in support of Swaraj. On the other hand, ministers sing praises of Modi and his ‘vision’ every day on their Twitter profiles, and also continue to wish their colleagues happy birthday. Just a year ago, union home minister Rajnath Singh too went through a similar experience. Following the attack on Amarnath yatris in the Valley that claimed seven lives, Singh tweeted that the people of Kashmir have strongly condemned the terror attack and that it “shows the spirit of Kashmiriyat is still alive”. He also mentioned that not all Kashmiris are terrorists. Singh faced the ire of right-wing supporters, who took to Twitter to criticise him; some even asked to have him fired from the cabinet. In September last year, when senior journalist Gauri Lankesh was murdered by a group of assailants outside her home in Bengaluru, many right-wing Twitter profiles used derogatory language for her. Union minister Ravi Shankar Prasad condemned the deplorable messages expressing happiness on Lankesh’s murder on social media. Prasad too was not spared by right-wing twitterati, who told him he is enjoying power because of the sacrifice of many RSS workers’ lives. I strongly condemn & deplore the messages on social media expressing happiness on the dastardly murder of #Gaurilankesh. Union environment minister Harsh Vardhan also had to delete his tweet supporting the Supreme Court ruling banning the sale of firecrackers in Delhi to curb pollution around Diwali. Delhi BJP spokesperson Tajinder Pal Singh Bagga even contradicted the cabinet minister by saying he would buy firecrackers worth Rs 50,000 and distribute them among slum children. Clearly, appearing even slightly secular is a risky job for a cabinet minister under the Modi government. Although the PM’s silence on important issues is not a new thing, not standing up for one’s colleagues requires a special effort. Previous articleEveryone travels, so why are we worked up over Rahul Gandhi’s holidays?